....are not doing well. They do not have access to quality health care or education, and as for girls even their right to survival is under threat. 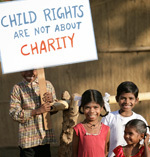 CRY UK along with its partner CRY, India's leading child rights organization are concerned that realizing the rights of children is not a national priority and continues to be a distant dream for millions of children. Promoting and protecting human rights of children is primarily a government obligation, taken on when the Indian Constitution was adopted in 1950 and reiterated to the international community, when it signed the International Convention on the Rights of Children in 1992. 40% of India's population is below the age of 18 years (at 400 million) is the world's largest child population. At 17 million, India is home to the world's largest population of child laborers (this is the official figure, activists claim the actual number is closer to four fold). 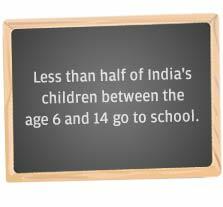 Almost one in every five children in India below the age of 14 suffers from diarrhoea, an easily preventable disease. ...child rights can only become central to India's agenda if its people choose to make it a priority by demanding government accountability to actualize the rights of children. In this context, CRY UK works single-mindedly to bring about a permanent change in the lives of children. We believe that providing relief is a short-term exercise and that sustainable change can be brought about only by addressing the structural and systemic root causes of poverty and social exclusion. CRY UK seeks your support to raise public awareness on the state of children, especially Indian and to press for the following non - negotiables in order to make a permanent change in the lives of all children. Ensure a universal definition of "child" to include all persons under the age of 18. All children aged 6-18 years, without discrimination, should be in formal, full-time schools that provide quality education. All children below 6 years should be provided pre-primary schooling opportunities. Governments should ensure that all children complete schooling. (The Indian governments expenditure on education should increase to 10% of GDP + the Indian Free and Compulsory Education Bill needs to be redrafted to remove sanctions on parents). Complete prohibition of all forms of child labor across sectors, including agriculture. Eliminate the culture of silence & shame around child sexual abuse which is the best kept secret of most Indian homes & communities. Existing research reveals that children of both sexes are vulnerable to it and most abusers are people known to the children, including family members. No child should go to bed hungry and no child should be born underweight and stay undernourished. (Coverage of the Indian Public Distribution System needs to be expanded to include all poor and socially excluded families + Provision of nutritious mid-day meals needs to be made available in all public primary schools + the Integrated Child Development Services needs to be made available to all children under the age of six years as per the Supreme Court order of November 2001). Increase budgetary allocations on Health to 5% of GDP. Revision of Policies for children from in line with the United Nations Charter on Child Rights (The Indian National Policy for Children (1974) to be redrafted in line with the Indian Constitution and the UN Charter on Child rights).